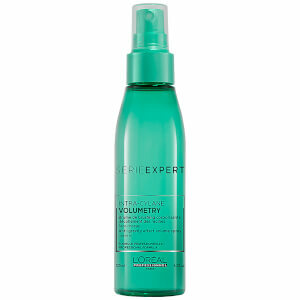 Turn up the volume with L’Oréal Professionnel Serie Expert Volumetry Root Spray, a lightweight formula designed to lift limp, flat hair from the roots for lasting body. Infused with ingredients inspired by skincare, the spray delivers deep hydration and adds a glossy shine to your hair. Key ingredient Intra-Cylane™ penetrates the fibre to create a flexible yet durable framework that supports the hair and boosts volume, whilst Salicylic Acid purifies and cleanses oily build-up. Especially suited for fine, flat and oily hair types, the leave-in conditioning spray leaves you with a gravity-fighting, voluptuous mane of healthy, glowing hair. Spray section by section on the roots and lengths of shampooed and towel-dried hair. Do not rinse. Aqua/Water, Alcohol Denat, Aminopropyl Triethoxysilane, Peg-40 Hydrogenated Castor Oil, Magnesium Sulfate, Lactic Acid, Phenoxyethanol, Peg-14 Dimethicone, Hydrolyzed Vegetable Protein PG-Propyl Silanetriol, Limonene, Ethylhexylglycerin, Linalool, Hexyl Cinnamal, Geraniol, Citral, Benzyl Alcohol, Hydroxyethyl Urea, Salicylic Acid, Benzyl Benzoate, Parfum / Fragrance. C159224/1.